It all starts with color! This Creative Converting 28191071 12 oz. plastic cup is perfect for your picnic, reception, and outdoor or catered event! Its Sunkissed Orange color adds a vibrant splash to your dining atmosphere and can easily be mixed and matched with other unique colors (sold separately) to match your events' theme and decor. 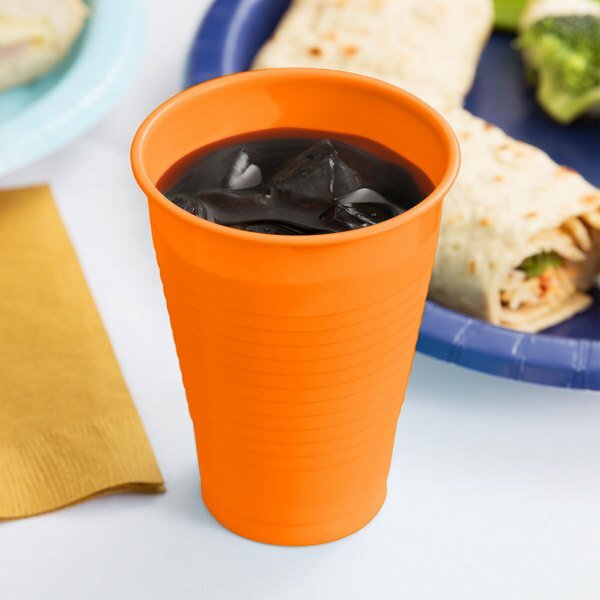 Made of polystyrene, this cup is durable and strong enough for parties and everyday use! 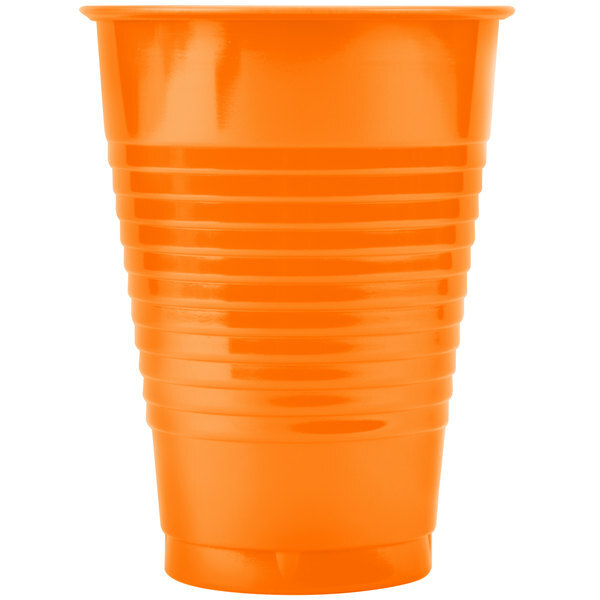 This bright orange cup can be recycled! Be sure you do not just throw these away. This is a very good quality disposable product. Get packs of 20 shipped directly to your door. Super convenient. We like all of the utensils in this sunkissed orange color family. This cup is nicely built and the bright orange color is great as well. 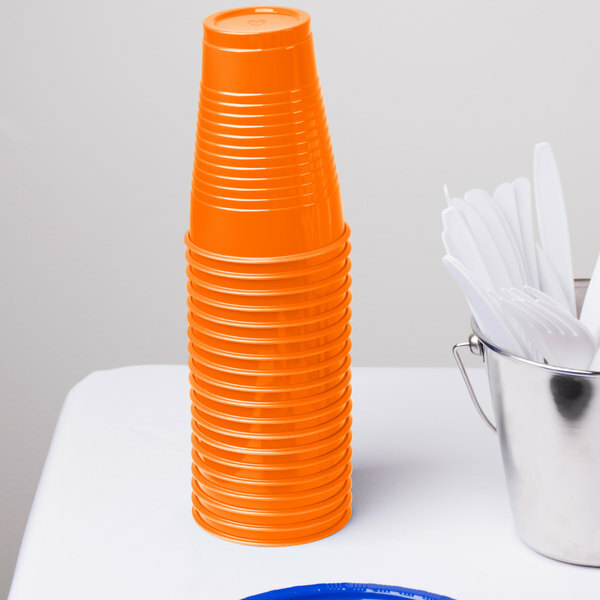 Great vibrant orange color with these cups. Sturdy enough for picnics or barbecues and no cleanup necessary afterwards. I love these cups at all of my cookouts. I have purchased many of the different colors of the creative converting 12oz. cups. these are some of the more true orange colors weve gotten. They are easy to hold hot and cold drinks alike and they are re-usable. A great company making a great product. One would not regret this purchase and the many other offerings that creative converting has. These were great for creating the pumpkin for our Haunted House/Kid's Land. We needed cups with solid colors inside and out. These were the perfect size and color! I didn't find the cups to be as bright as the pictures, which is a plus! They are extremely durable and re-usable. It really saves a lot of wear of washing dishes in our dishwasher AND saves resources like water and power. Used the Creative Converting 28191071 12 oz. Sunkissed Orange Plastic Cup - 20 /Pack to hold a Kiwi strawberry fruit juice cocktail drink. The drink is so deliciously orange that the name is so perfect. It seems like as if the cup got kissed and that is how it got its perfect orange color.